What Happened to me Lately? Folks who have been following me probably realize that I was devastated when my mom passed away six months ago. Our bond was just so strong and the memories of how my mom suffered and how she cared for us will remain forever. The first few months were spent in organizing the cremation and burial of my mom next to my dad, requiem masses and sorting out the will and the estate. I prepared a memorial blog of her which housed some 260 photos taken at various times of her life. As a result of this preparation, I sort of re-lived her life and refreshed my memories about her kindness. Then we went on a trip to Xian to visit the Terracotta site and the steepest mountain HuaShan in China. The trip didn’t help, at home I was more occupied. On the trip, there were many quiet moments when I was left to myself and I sank back to my grief. Back home, two things happened to me. Firstly, I damaged my external hard diskette with all my travel photos which I didn’t back up for the last 1.5 years. I clumsily dropped my external hard disk on the floor as I pulled out the connection to the PC. I was rushing out to meet an old classmate from the States whom I haven’t met for over 40 years! I took the HD to an expert who is able to recover the data after some weeks – with the exception of one photo! He charged me approximately USD 500 for the recovery. It was costly, but this saves my effort of rescanning all my mom’s photos, editing them and classifying them and all my researches on Chinese Calligraphy with all the classifications, not to say my travel photos. That really teaches me that I have to be disciplined in backing up data ( I am still thinking what is the best way to do this). 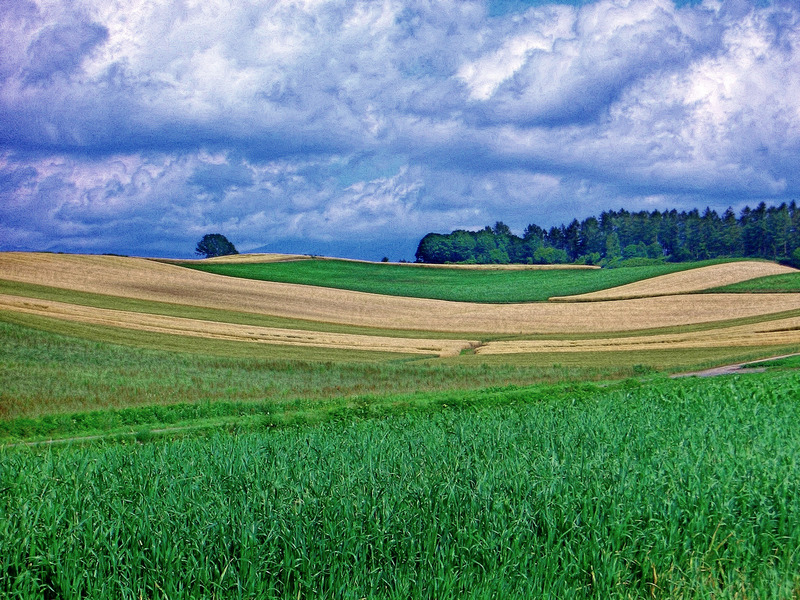 Losing all the files, I resorted to convert some of my previous photos to HDR images using a free software. This explains why you have been seeing my HDR images recently. Starting almost two decades ago, after each trip, I have the habit of choosing the travel photos I like, blow them up to approximately A4 size and mount them up on black card boards. I was thinking that, one day, I will have a private exhibition of my photos. Those were the days when I insisted on taking film pictures and not electronic images. Unfortunately, I am a lousy keeper and lost the negatives. The good news is that I have just recovered around 100 card board mounted photos from my mom’s home when I cleared her flat. She keeps everything, even my kindergarten report cards. Thank you mom! 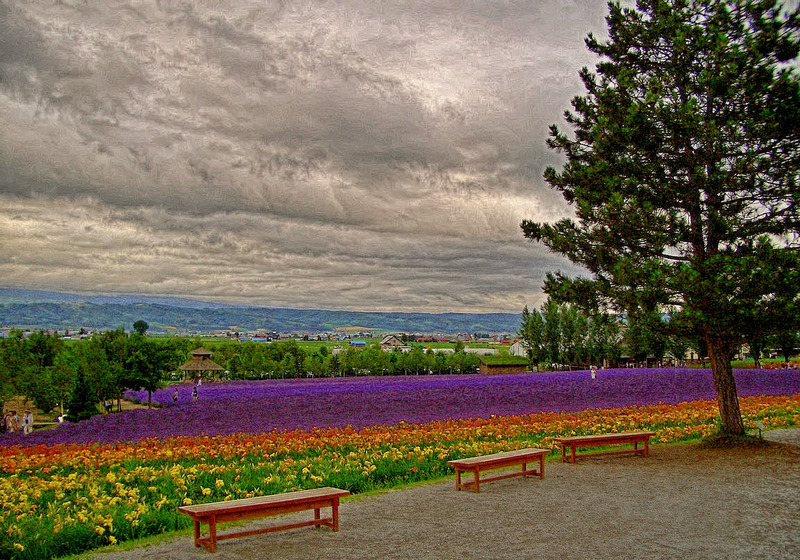 The photo here was taken in Furano, Hokkaido, Japan in the Summer. This is one of the photos which I have never published as I did not have any electronic images and the negatives were lost. All I am doing is to photograph the card board mounted photo and upload it here. There will be more of these coming!